Organized retailing in India is still evolving in terms of reach and process maturity. One of the key metrics for process maturity for a retailer is Inventory Turns. The roadmap for improving this metric is a holistic effort covering demand and supply side functions. Organized retail in India is rather young – the larger ventures in this space didn’t start until late 1990’s. We have made good progress since then. There has been thousands of crores invested in setting up retail businesses everywhere in India. These investments have gone into acquiring the most basic resources and capabilities to setup shop – trained workforce, suitable shopping space (suitable in size and location), distribution infrastructure, basic vendor agreements, etc. All of the large retailers today either have setup these basic resources and capabilities or have made definite progress towards these. It becomes imperative that the next round of investments should be in developing more advanced resources and capabilities. Indian retail does certainly need more advanced resources and capabilities, especially since we still compare very bleakly to retailers in developed retail markets. One key metric to note in this regard is the inventory turnover. Inventory turnover indicates the velocity of goods movement in the retailer’s value chain. This velocity is not just a factor of distribution and procurement processes. It is also a factor on how well the retailer understands his customer and stocks his stores for it – if the customer doesn’t like the goods, they won’t move as fast in the value chain. Hence, inventory turnover is a key indicator of the maturity the retailer’s processes in doing the above (There is a more popular indicator in the retail world – GMROI – since retailer’s balance sheets today include their manufacturing operations, this is not considered here. The argument to be made in the article is the same with this metric as well). Comparing the inventory turnover’s in the apparel retailing business of prominent players in India and a developed market like USA showed just how big the gap is – (see the diagrams below) US retailer was moving goods across 19,000 Kms +, across multiple nations and an ocean and across varied language/customs domains and yet achieved 3 times better inventory turnover than the Indian retailer. An interesting note is that the US retailer’s value chain stretches into countries with evolving infrastructure in Asia. Therefore, the credit to better performance cannot only be conferred to the better roads in US. What other factors contribute to this performance? An analysis of the contributing factors yields the following roadmap (this is called as roadmap as there is a definite sequence to building these factors into a retail business). 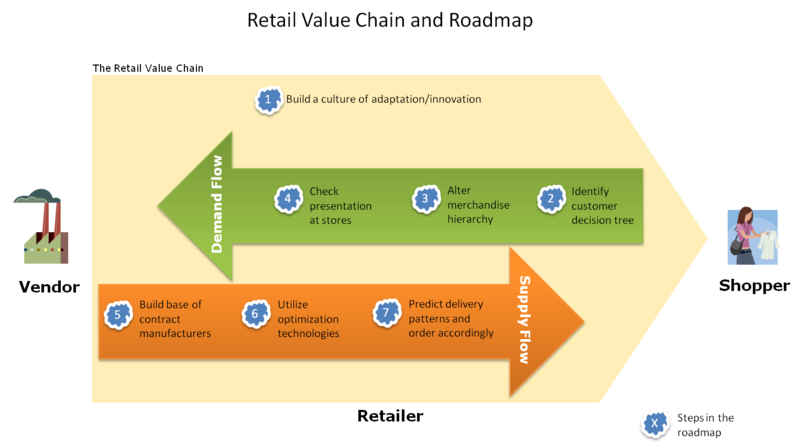 The roadmap to building the process maturity, to achieve the level of performance of a US retailer, begins from not imitating the US retailer - US retailers face different regulations, different market conditions and different geographic features. The roadmap begins from building something more fundamental than mimicking the practices of a US retailer - it begins from building a culture of adaptation and innovation. Culture is often the first thing to be changed before a large change happens. Quality Management Strategies have often highlighted this to the Manufacturers. The cultural change required here is about empowering various sections of the employee base with suitable tools to analyze processes, establishing forums for evaluating ideas at various levels, encouraging talent acquisition with varied exposure and building a vision statement that clearly communicates this. However, this is just the first of the steps in the roadmap to higher inventory turns. The roadmap has to be more holistic as the metric of inventory turns, as noted earlier, is more holistic in nature. This roadmap touches demand and supply sides of the retail value chain as indicated in the diagram above. The next steps in the roadmap will be elaborated in the subsequent articles in this series. In brief the next steps involve planning the demand flow and supply flow, more efficiently.